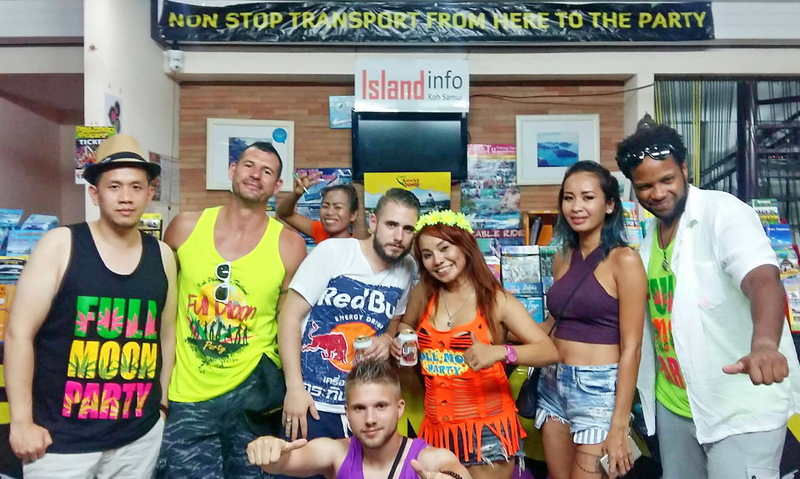 Island Info Samui has arranged Full Moon Party transport for over 37,000 party animals and countless tours to Koh Phangan, Koh Tao + Ang Thong National Marine Park. and Samui’s leading Travel, Ticket & Tour Agency. What can ISLAND INFO SAMUI help you with? All the Island Info staff speak English, so communication is easy! 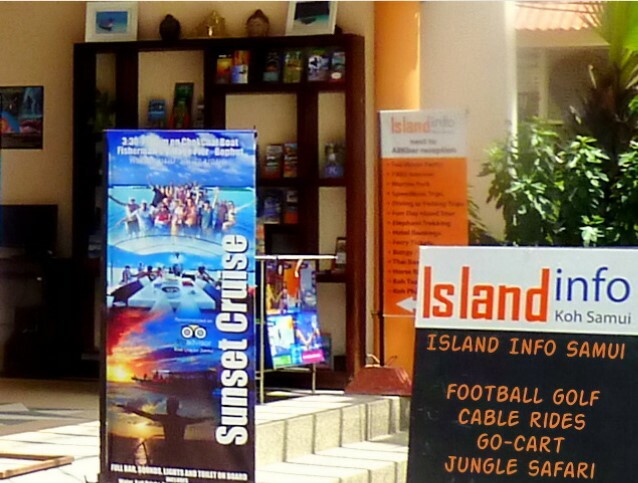 There is no time-wasting or frustration at Island Info Samui! 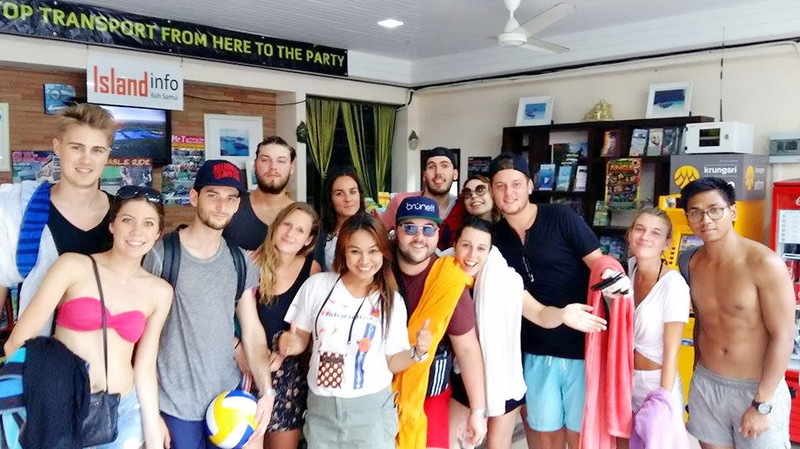 We have a total of 30 years work experience in Koh Samui, add to that our ARKbar experience and the result is Island Info Samui is the most informative and trusted travel and tour agency on the Island. 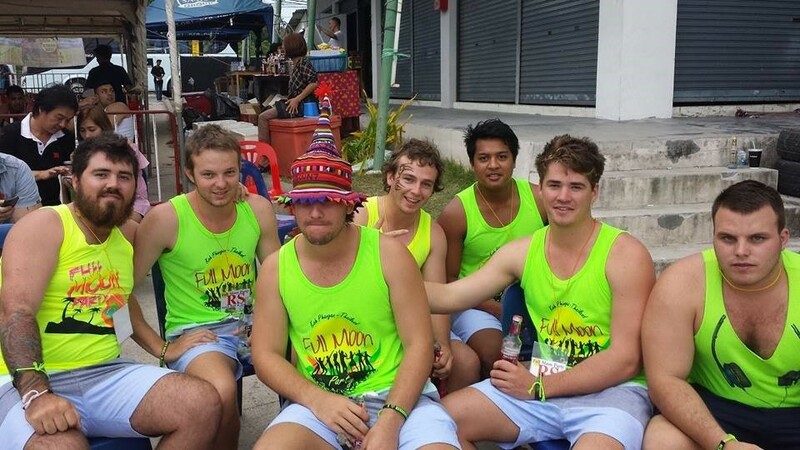 Island Info Samui are on-site at the speedboat departure point every Full Moon Party. If you need assistance, look for the Island Info Samui guide, they will be wearing the Island Info t-shirt. ARKbar Pool Party – EVERY DAY!! Could you please provide the total fee (1+2) for me? Thanks !! How can I book the booze bus for a hen night? Thank you for your inquiry about the Booze Bus. You can either send an email to bookingsislandinfo@gmail.com or alternatively send me a message via the Island Info Facebook page https://www.facebook.com/IslandInfoThailand with the details of your Hen’s Night, and I will respond as soon as possible. Cheers. This is our 3rd trip to ark bar and would like to check with you in regards of transportation and also hotel booking in ark bar. Appreciate you could get back to me via email so we could discuss further. at your disposal for any further information if necessary. We would like to go the the full moon party on September 27th 2015 from Koh Samui. How do we go about booking? Booking transport to go to the Full Moon Party is very easy. You do not need to book in advance. The best way to book is to come to the Island Info Samui shop, it is centrally located inside ARKbar Beach Resort in Chaweng. We can discuss the best times for you to arrive at the Party and give you your tickets in person. What date do you arrive in Koh Samui? First of all, thank you for your website. It is very comforting to find such good information, and I am sure I will be using your services this coming January. I have heard horror stories in general (not about island info) about the speedboat service. Super long waits, super disorganized (unlike a first-come-first-serve service) and dangerous rides. It looks like ferrys are by far safer than speedboats. What do you say about the wait and speedboat vs. ferrys? A very good question. The answer is complicated because it depends on many things, such as, where you are leaving from, are you staying overnight or longer, are you returning the same night and so on. Because of these variables, what is the correct answer for 1 person may not be correct for another. You are spot on with your observations and comments regarding a less than adequate service, I am happy to say that the speedboat experience is going through a transformation. The safety issues have been addressed and all normal safety measures are being adhered to. The transport to the party is timely and rarely late. Coming back is more difficult because it is impossible to book times for the return journey, although I will be testing an new system over the next few months. There can be a wait, depending upon the time you want to return and the time of the year, for the return journey. There are VIP tickets available that do get you onto the next available boat when returning. Until I know your exact travel plans and preferences, it is impossible to advise you on taking the speedboat or ferry. Feel free to ask more questions or contact me personally via our Facebook page. Hi Danny, thank you for your message. It is very easy to book the tour to Koh Nang Yuan. Simply come to our office the day before you want to go and we will show you the various tour options and prices. The average price is around 1200 baht. The whole process will take around 10 minutes. We are next to the main ARKbar reception in Chaweng. Myself and a friend are traveling in SE Asia in May Vietnam Cambodia and Thailand. We want to make the full moon party on the 21st but have a tight schedule And plan to arrive in Bangkok early on the 20th, how would you advised we get to you? Can you advised places to stay for a few nights? Can you contact us regarding transport and entry to the full moon party on the 21st? Hi Alex, If you like to party, stay at ARKbar Beach Resort in Chaweng or close to there. You can find me and our shop next to ARKbar reception. Every taxi driver knows ARKbar, so you will have no trouble finding the hotel or us. Hi there, I’m just wondering how much a return journey for 5 people is from ark bar to the full moon party on the 19th June, and what time the last boat is to there and the times of the return journey? Hi Christian, the return journey from ARKbar to the Full Moon Party is 1,000 Thai Baht per person. This includes the express transport to the speedboats, the return speedboat to Koh Phangan and the van back to ARKbar. It does not include the 100 baht Party Entry Fee that is payable only in Koh Phangan. Hi James, yes, there are many boat charters are available. Can you please tell me the number of guests that will be on the boat and if you require a full day or half day.